Leo, his mate Muneca, and daughters Africa and Kiara have been reunited in the African bush after they were torn apart by a travelling circus in South America. The wonderful news comes after tens of thousands of people watched a viral video of Leo, groggy with anaesthetic following dental surgery, battling to reach Africa as she willed him on and reached out for her father. During the biggest operation of its kind ever undertaken, ADI rescued over 100 animals (lions, bears, tigers, monkeys and others), closing down Peru’s wild animal circus industry. 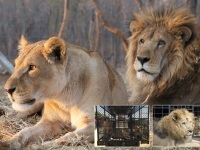 In May, ADI flew the 33 lions rescued during the mission to South Africa to start a new life at Emoya Big Cat Sanctuary. The video of Leo recovering shows the importance of family bonds in this social species. As he began to recover from anaesthesia he slowly stumbled and dragged himself towards his anxious daughter Africa, who appeared to be urging him on from behind a fence, even reaching her paw out to him. Once Leo reaches her, they nuzzle and he settles beside her for a few minutes, but soon recovers and is back on his feet as if nothing had happened. At the time the lions were in “bonding” camps, preparing them for reintroduction, with mesh between them allowing contact but ensuring they could not fight. Now the family is back together. Against all of the odds, these lions have been saved from circus suffering and the family reunited back where nature intended in Africa. Now we need your help to provide a huge natural bush enclosure for this family, with self-filling water holes and secure solar powered electric fences, that will be their happy-ever-after. These habitats will be completed for all the lions rescued costing up to £100,000. Please donate today and help us raise the £12,500 needed for Leo’s family enclosure, where the lions will be cared for by ADI at Emoya for life. Any extra funds raised will go towards the enclosures for the other rescued lions and care for Leo and his family.